My mom, now 88, spends time these days relishing the memories of things from long ago. One of her favorite memories involves verbally imitating one of my younger brothers from his toddler years. He had a question he repeatedly asked in those days: "What time is it?" I've heard her tell this story so many times, that I am not sure if I remember him saying the phrase or if I have recalled his voice through her telling of the story. I can, however, hear his sweet young voice say the question over and over again, "What time is it?" After telling the story again, mom laughs, and then adds, "Of course he had no idea what time was or why he asked it, but it was certainly important to him!" On one occasion, while he was eating with them, he gave them this command: "Do not leave Jerusalem but wait for the gift my Father promised, which you have heard me speak about. For John baptized with water, but in a few days you will be baptized with the Holy Spirit." Then they gathered around him and asked him, "Lord, are you at this time going to restore the kingdom to Israel?" He said to them: "It is not for you to know the times or dates the Father has set by his own authority. But you will receive power when the Holy Spirit comes on you, and you will be my witnesses in Jerusalem, and in all Judea and Samaria, and to the ends of the earth" (Acts 1:4-8). Yes, their question indicated that they needed fresh insight from the Holy Spirit because they still didn't understand what Jesus meant by the Kingdom of God. At another level, however, they were asking a question that believers have asked ever since: "Jesus, what time is it in our world? When will your Kingdom dawn in all its fullness?" I can still remember riding in 110-degree heat from El Paso, Texas, to Canyon, Texas, through southern New Mexico. I was with a school bus full of teenagers that I was chaperoning — I was the ripe age of 20. The guy who previously had been working with these kids was under investigation. I was on my own, too young to be a chaperone. As the bus became hotter, I became grumpier and gloomier. I had been a few minutes late getting to the bus because I had been at the hospital emergency room and praying over a teenager fighting for his life from a drug overdose — something I could not share with the kids. How insufficient I was for the ministry challenges I faced that day? How I was going to explain what was going on with the young man in the hospital to his friends? Why was I the lone chaperone for so many teenagers when I was barely older than some of them? Why hadn't we waited another two hours to leave on our trip so it would be mostly in the dark and cool of night? About the time I was wrestling with all those issues, I remembered something a well-known Christian author had claimed. He had predicted that Jesus was going to return on this very day of our bus trip. This hard day was supposed to be the date for the rapture. Sweating profusely in a bus full of noisy and rowdy teenagers, sick at my stomach from the heat, overwhelmed with my insufficiency and the smell of that old school bus, I was ready for the Lord to come and rapture me off that bus immediately! I couldn't help but laugh at myself. Then once I started laughing, I couldn't stop. The more I laughed, the more sadly funny it all seemed. Only Jesus' return could ransom that moment for me with a precious young man fighting for his life, the inescapable heat, being left alone to chaperone all those kids, and all those noisy teenagers on the bus! Jesus didn't come and rapture me off that bus. Obviously, the author was wrong — just like everyone who ignores the biblical instruction that none of us can really know the day or the hour when the Lord will return like a thief in the night[NOTE] (Luke 12:38-40; 1 Thessalonians 5:1-3). 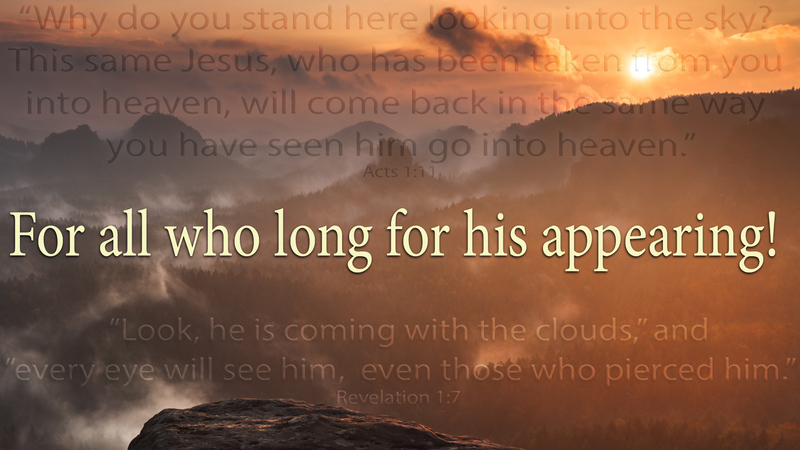 If we love the Lord, most of us can't help but wonder when he will return. We can't help but yearn for the glorious dawning of the full expression of the Kingdom of God. We all have challenges we don't want to face or feel insufficient to meet. However, Jesus' answer still stands: "It is not for you to know the times or dates the Father has set by his own authority" (Acts 1:7; Matthew 24:36). Jesus is still working in us, through us, and among us today, just as he did in his time on earth and in the book of Acts (Acts 1:1). We have the example and teaching of Jesus to help us proclaim the good news of the Kingdom of God and live its values as his disciples (Acts 8:12; 28:31; Romans 14:17; 1 Corinthians 4:20; Colossians 1:12-13; 1 Thessalonians 2:11-12). We can face our challenges in this world with fresh hope because of Jesus' resurrection from the dead and what it means for our lives — that what we do for the Lord and his Kingdom is not done in vain (Acts 1:3; 1 Corinthians 15:50-58). The Holy Spirit has been given to us as baptized believers in Jesus to empower us to do what he has called us to do and to be the people he has called us to be (Acts 1:8; Acts 2:38-41; Titus 3:3-7). 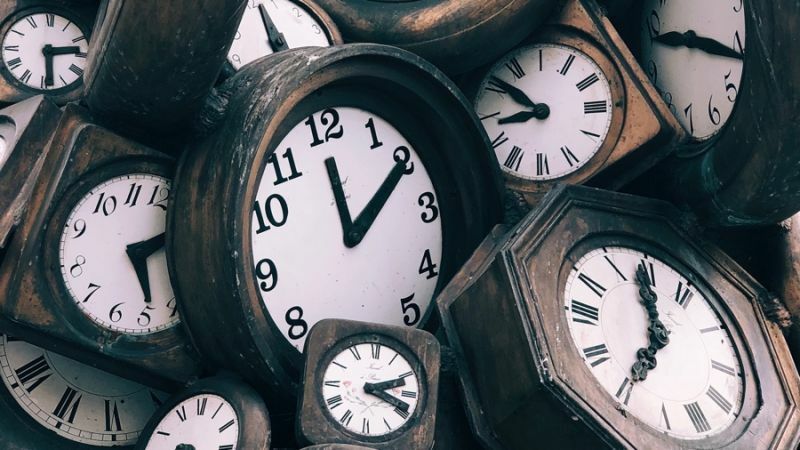 So, as I wondered on that hot bus over forty years ago, as my little brother asked six decades ago, and as the first disciples of Jesus asked over two-thousand years ago, let's ask: "What time is it?" And, let's hear heaven say, "It's time for you to live Jesus' way, the way of the Kingdom of God, in your daily lives. Your world is fractured and lost. It needs to see what the way of the Kingdom looks like in real life today. Live that way, and you will be ready for its full dawning when Jesus returns. Please do it, and we will be with you every step of the way as the Holy Spirit empowers you." What time is it in our world, today? 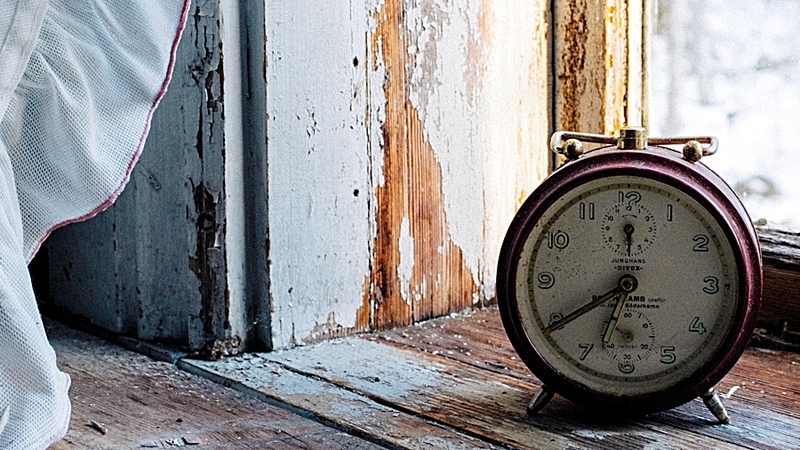 [NOTE] That we cannot know the day or hour doesn't mean Jesus' followers will be surprised by his return. We shouldn't be surprised at whatever time he does return because we have been living always to be ready for his return. Jesus was reminding his followers, along with telling us, that figuring out that exact moment is not our job because only the Father knows (Acts 1:7; Matthew 24:36). God's Kingdom will dawn in all of its fullness at his choice, not ours! However, we are called to be his Kingdom people, now. Today's message is part four of an eight-part series called 8GHT — Eight Truths that Turned the World Upside Down! "What Time Is It?" by Phil Ware is licensed under a Creative Commons License. Heartlight encourages you to share this material with others in church bulletins, personal emails, and other non-commercial uses. Please see our Usage Guidelines for more information.